One of my favorite families of plants is the Orchidaceae or the orchid family. In New York, there are 20 genera and 70 species of orchids (New York Flora Atlas)! 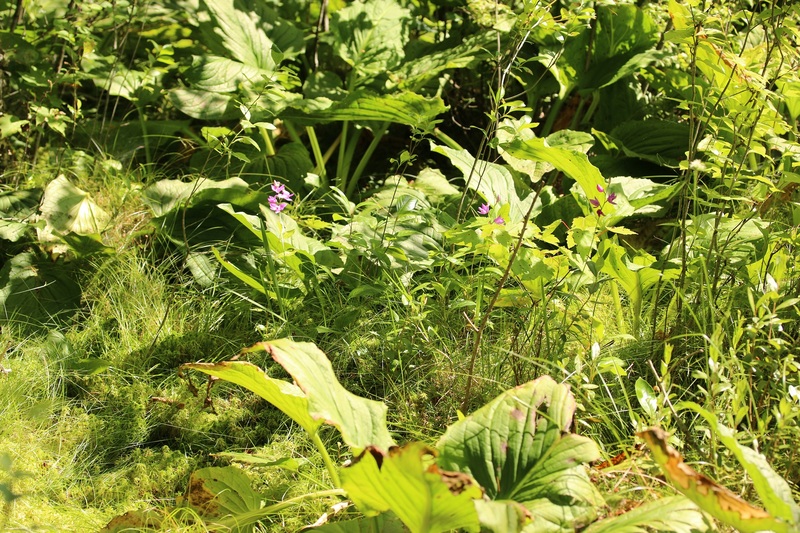 Many of our native orchids live in wet areas, such as bogs, fens and flooded meadows. I am always on the search for new wetlands that could be the perfect area to find orchids. One such wetland is a local bog north of my town. I knew that there has been orchids found growing there so I had looked for them for a few years but never found anything. 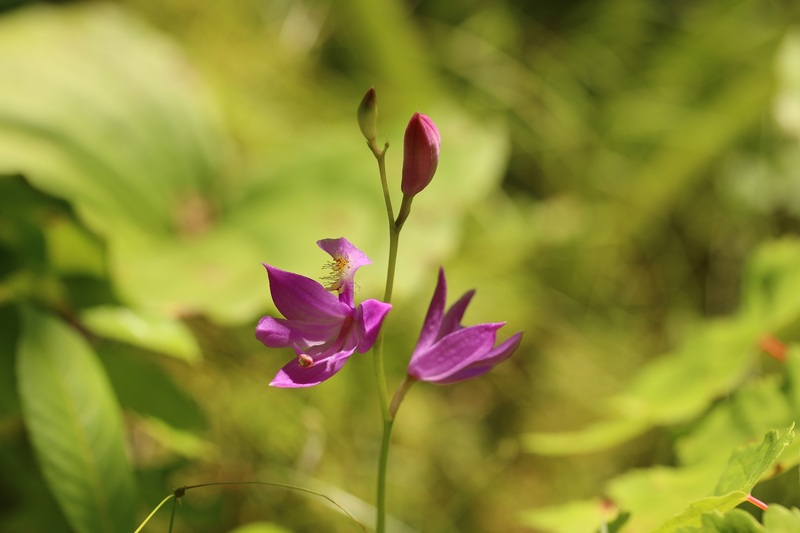 I realized I had been going at the wrong time of year so I visited in late July last year and found beautiful stands of tuberous grass pink orchids or Calopogon tuberosus! The genus name Calopogon comes from Greek meaning “beautiful beard”, which describes the yellow bearded lip. The specific epithet (species name) “tuberosus” refers to the swollen underground stem. The common name “grass pink” refers to the color of the flowers and the thin, grass-like leaves (Wildflowers of the Adirondack: Grass pink). The thin leaves make it hard to spot if it’s not budding, blooming or fruiting. While the flowers look like they are upside down (yellow lip pointing up), they are actually rightside up. All orchids have upside down flowers, which twist upright (lip down) as they open. 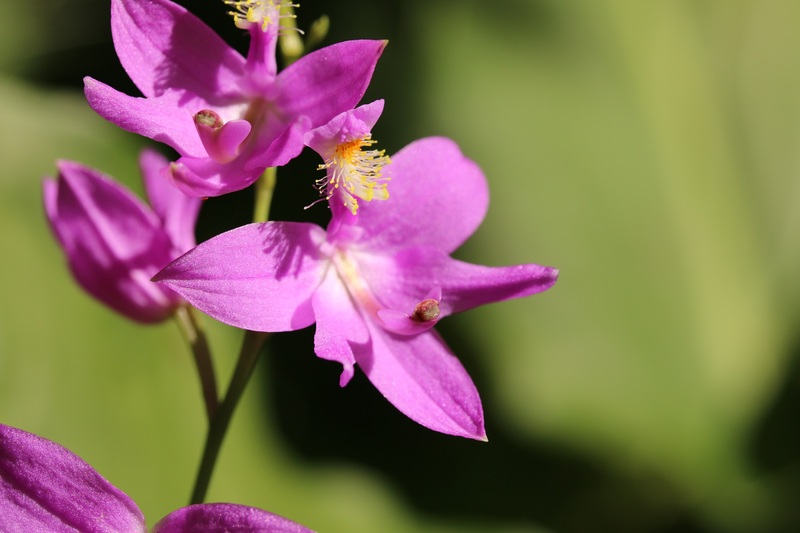 The tuberous grass pink’s flowers never twist, leaving the lip at the top of the flower (Go Orchids: Calopogon tuberosus). The tuft of yellow hairs resemble structures full of pollen, a great reward for pollinators. If a heavy pollinator tries to gather pollen from the lips, the lip will swing down, dropping the pollinator on the column that contains the actually pollen. Orchids have packets of pollen called pollinia that include a sticky pad to attach the pollinia to unsuspecting pollinators. The pollinator will hopefully do the same to another tuberous grass pink, depositing the pollium to stigma (female part) of the next flower. Since the pollinum holds thousands of individual pollen, a single successful pollination results in thousands of tiny seeds (Go Orchids: Calopogon tuberosus). Bumblebees and other heavy bees are the main pollinators of the flowers. Other bees, flies, butterflies and beetles visit the flowers, but they are unlikely to be effective at cross-pollination due to their light weight (Illinois Wildflowers: Grass pink). Grass pink grows in wet and acidic soils, such as bogs and fens. It usually grows in full sun but can survive in shades areas as well (Wildflowers of the Adirondack: Grass pink). 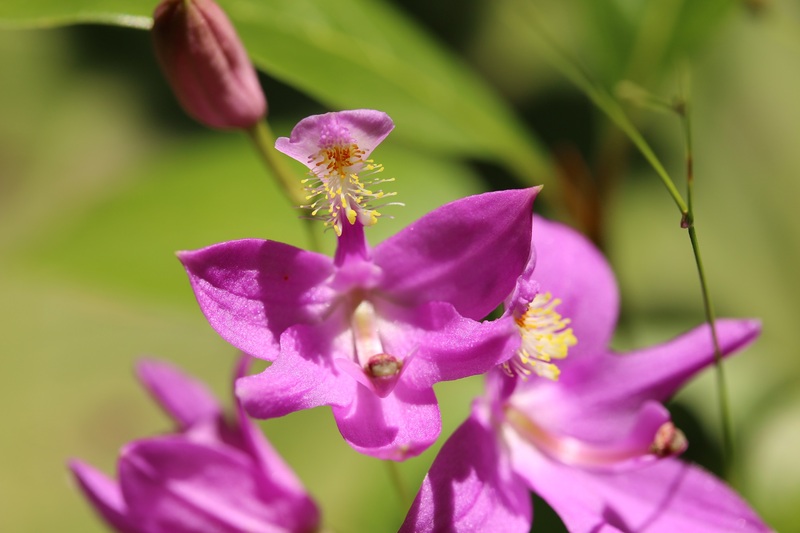 The tuberous grass pink has a very broad range, growing across much of eastern Canada, the United States (from Maine to Florida, Minnesota to Texas), and the northern Caribbean (Go Orchids: Calopogon tuberosus). Tuberous grass pink is endangered in Illinois, Kentucky, and Maryland, is listed as special concern in Rhode Island and is exploitably vulnerable in New York (Wildflowers of the Adirondack: Grass pink). There are actually five species in the Calopogon genus in the US but only the tuberous grass pink is found in New York. 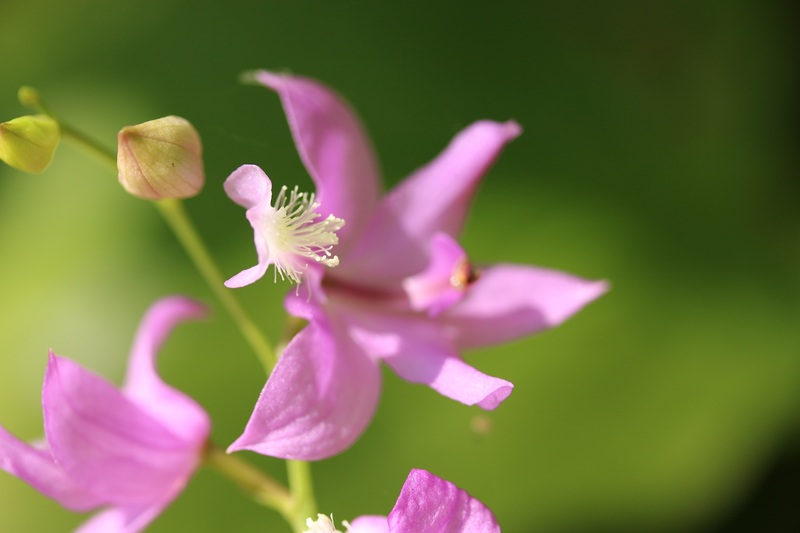 Three of the five are only found in the South (bearded grass pink – C. barbatus, pale grass pink – C. pallidus and many flowered grass pink – C. multiflorus), the Oklahoma grass pink (C. oklahomensis) ranges from the South up to the Midwest (Go Orchids: Calopogon).